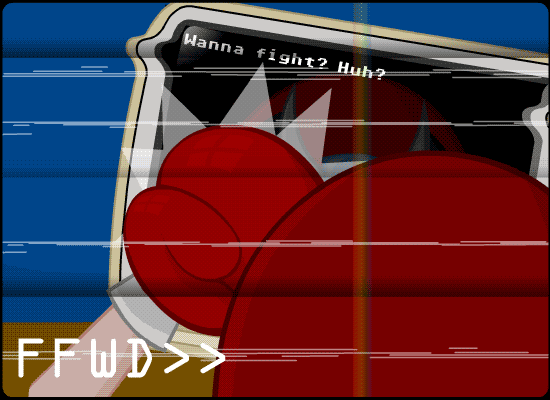 Strong Bad Email : "2 emails"
An email comes up, Denny asks SB what he thinks of Delaware. DELETED!!! Homestar shows up and writes "Hey strongbad . I built a time machine by putting a Gameboy in a blender. I used your blender, and also your Gameboy. I will go into the future and buy you new ones." SB returns, and writes "Only a few minutes left. I think I can hear some of the ladies giggling and saying how they like me and stuff. Or maybe that's just The Cheat ." Click "Backwards" to see another cheesy effect.. backwards..